It was discovered recently that General Motors has moved to protect the names Corvette E-Ray and E-Ray for use on an automobile, but I still don’t believe that we will be able to buy an electric-powered Corvette anytime in the near future – so all of those enraged Corvette loyalists can take a nice deep breath. Last week, the news surfaced that General Motors had trademarked the names Corvette E-Ray and just E-Ray with the US government for use on a vehicle. As is the case with most trademark filings, the information is very brief, but the fact that GM moved to protect these two names led some outlets to quickly speculate that there was an electric vehicle of the Corvette Stingray on the way. After all, calling an electric Corvette Stingray the Corvette E-Ray makes perfect sense. When this news hit the internet, even though it was based almost purely on speculation, Corvette traditionalists took to the pages of Facebook to insist that anything other than a gasoline-powered V8 in the mighty Stingray would be nothing short of blasphemy. Fortunately for those folks, I really don’t believe that we will see a factory-production electric-powered Corvette anytime in the near future – trademarks or not. General Motors is one of the leading automakers in the area of vehicle electrification, with the Chevy Volt serving as the American industry’s bestselling EV for a few years before facing any real competition from Nissan and Ford. In addition to the extended range Voltec drivetrain in the Volt and Cadillac ELR, Chevrolet also offers the pure electric Spark EV and some gas-electric hybrid vehicles like the Malibu – allowing GM to offer one of the most expansive electrified drivetrain lineup in the US. If any of the American automakers were going to offer an electric high performance vehicle, General Motors’ experience in that segment would make them a frontrunner while the lightweight Corvette Stingray would seem like the ideal vehicle to carry an electric drivetrain. However, even with high performance vehicles with electric propulsion systems (like the BMW i8) and high performance hybrids (LaFerrari, Porsche 918), I don’t think that we are going to see an electric Stingray – or Corvette E-Ray – in your local dealership anytime soon. Although GM is a leader in the electrification movement, the technology is still fairly restrictive – particularly in the areas of range and recharging speeds. An electric Corvette Stingray could most certainly offer incredible performance, but that performance would greatly reduce range. With recharging times in the EV segment ranging anywhere from 4 to 14 hours depending on the battery levels, the battery size and the quality of the charging source, this electric Corvette would likely take a very long time to refuel after a couple runs down the quarter mile or a couple hard highway runs. Sure, the Corvette E-Ray could offer emission-free cruising, but if the driver wanted to let the electric Stingray stretch its legs at all, it would lead to a very short cruise. Im sure that some of you are wondering why General Motors would bother to trademark the E-Ray name if they don’t intended to offer a vehicle with this name in the near future. First, it is not unusual for an automaker to trademark a name simply to protect competition from using that name and that could be the case here. Perhaps GM wants to prevent any aftermarket companies from building their own electric C7 Stingray and calling it the E-Ray. Next, and what I believe to be more likely, is the possibility that GM is working on an electric Corvette concept car wearing the E-Ray name. We have been wondering what the next step might be for the C7 Corvette and I am wondering if the company might not roll out an electric Stingray concept at the upcoming Detroit Auto Show. While the E-Ray might not be the next step in the life of the C7 Corvette, it would certainly draw a world of attention at the Motor City show. However, even if GM does bring out an electric Corvette in Detroit, I don’t expect to see one in your local Chevy dealership without some major advancements in the battery life or charging capabilities of GM’s electrification program. In short, if you are an EVangelist holding your breath for an electric Corvette Stingray, you might want to take that breath or look elsewhere. There might be an electric Corvette someday, but with the current level of electric propulsion technology, I expect gasoline to be the only fuel in the Corvette well into the next generation. It would not take long to recharge. The model s uses about 1/2 a kwh in a 1/4 mile run after regen. That means a model s could do over 150 runs on a single charge totaling about $10 in electricity. Even with a small 6.6kw charger it would take about 5 minutes. The auto-racing industry has fully embraced hybrid technology. Hybrid electric is the 21st century turbo. Hybrids have won the past few 24 hours at Lemans and are prominent in Formula 1 and other racing circuits. This hybrid racing technology has already worked its way into several production vehicles. 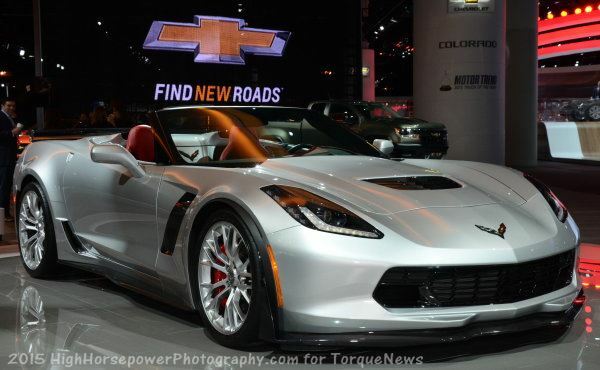 So for those purists that think only a V8 will power the Corvette's of the future, think again. I fully expect to see a hybrid engine powering Corvettes, possibly before the end of the decade. A full EV? That's a different story. I do not expect this, despite the fact that GM has already developed all the technology necessary to build a high performance electric Corvette that would rival the Tesla Roadster. I agree with the author. This was more about protecting the name, than an indication of GM's development plans.